It’s been a long time since I’ve posted topics relating to JavaFX. So, if you are still following along, awesome! In this blog post I want to blog about a very cool feature starting with JavaFX 8 update 20 that allows your application to always be on top of other applications. What this means is that on your desktop your JavaFX based application can be a floating widget that will remain above all other applications (z-order). An example would be a weather widget in the upper right corner never to be obscured by other applications. So, I’m very excited to share with you this amazing feature ‘Always On Top’. In the past Java Swing developers would rely on the method Window.setAlwaysOnTop(boolean). This feature allowed Swing developers to build native looking and native behaving desktop applications. Ever since JavaFX 1.x this very feature was highly requested (originally requested by Stephen Chin @steveonjava for the WidgetFX framework). This feature request is JIRA ticket RT-153. Figure 1 is the feature request shown with a status of ‘Resolved’. Although this feature didn’t get into JavaFX versions 1.x, 2.x and the version prior to Java 8u20, it is finally here now. For those who don’t know how to report bugs or file new features requests I encourage you to head over to the JavaFX JIRA system. Assuming you know the basics of JavaFX since version 2.0 a typical application would consist of extending from the javafx.application.Application class. When developing JavaFX desktop applications the platform API would provide you with a (javafx.stage.Stage) window. The Stage object will have the following methods to access the always on top property. The following code snippet sets the Stage to be always on top using the method setAlwaysOnTop(boolean). Shown in the listing above the start() method sets the stage to be transparent to be a JavaFX window without a title bar. This allows applications to have irregular shaped windows on the desktop. If a web person trolls you again about JavaFX ask them the following question: “Can HTML5 create irregular shaped windows on the desktop? (always on top)”. 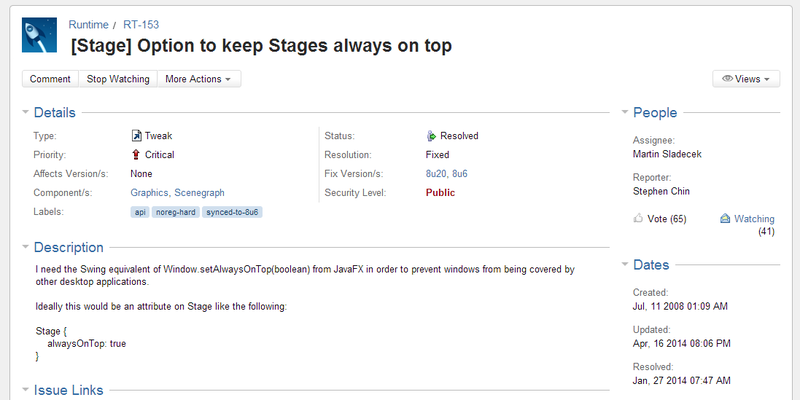 Next, the stage is setup to be always on top via the setAlwaysOnTop() method. To see the full code listing visit the Github project ‘KeyholeWidget‘. I hope you’ve enjoyed this cool feature (I know I did). As usual please leave comments below. This entry was posted in Custom Controls, JavaFX and tagged alwaysontop, custom controls, design, eWidgetFX, JavaFX, javafx8, stage, widget, window on May 19, 2014 by carldea. Finally 🙂 Thanks for letting me know. I’ll see if my clock can use this.